I hate to say this, but “Flash Back” may have actually made my love for The Flash start to wane. It’s actually the opposite of what you’re probably thinking. “Flash Back” is a wonderful episode of the series and easily one of the best episodes of season two, but so much of that is predicated on the fact that Barry time travels back into the first season of the show. A big chunk of that has to do with Tom Cavanagh as Harrison Wells/Eobard Thawne. Getting to see Cavanagh as that character again was an utter joy, and even better was when he revealed himself to Barry. Cavanagh KILLS as Thawne, providing the kind of delectable villain that Zoom has never been and will never be. There’s such amazing enmity and contempt in Thawne, but he’s not above helping Barry to get his plans back on track. Heroes are often only as good as their villains, and I think “Flash Back” brings the stark differences between season one and season two to the forefront in a way it definitely didn’t intend. This episode also features something we’ve been missing since the introduction of Earth-2: expanding the mythology of The Flash thanks to the presence of a time wraith. While Zoom has appropriated elements of the Black Flash, it’s the time wraith that feels most like that spectral enemy. 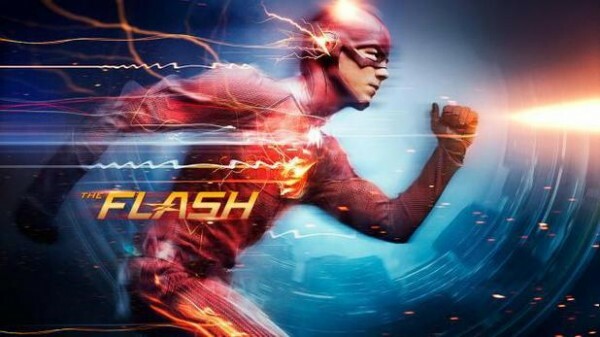 It’s clear that the wraith is some version of The Flash due to Barry’s costume being present on the wraith’s decayed skin, and that opens up a new world of theories. I love that this show embraces such comic book ideas because it shows that these concepts have persevered over the decades for a reason: they are incredibly fun to pontificate about. It was also a delight to see Eddie once again, and I’m still convinced that he’ll be returning in some form or another. I have to believe that seeing his body get sucked into the singularity at the end of season one was no accident. I’m kind of mad at “Flash Back” for making the weaker parts of season two stand out so harshly. At the end of this episode, I wasn’t enthused about Barry’s promise to come after Zoom. I still maintain faith that the writers will find a way to surprise me by the end of the season, but with the show going on hiatus again, I don’t know how amped I’ll be when it returns. I kind of just want to go watch season one again. Favorite moment: Other than Tom Cavanagh getting to play Eobard Thawne again (the real best part of the episode), I gotta give Cisco some love for name-droppin’ The Frighteners. That movie is my jam. Unfavorite moment: Maybe I’m spoiled, but remember when episodes of this show always ended with a little coda that mimicked the teasing nature of those post-credits stingers everyone loves so much? Why have they stopped doing that? Just a little bit of a tease of what Zoom is doing over on Earth-2 would be enough. Nothing has to be revealed but keep the mystery of his motivations alive. The stingers in season one were always a treat that also kept us invested in what was going on with Wells/Thawne. Season two just hasn’t taken advantage of this enough. If you like how stupid I am, you can follow me on Twitter and listen to my podcast.